iSpy is both a Windows application and a web application. The Windows app lets you add cameras and microphones to a "surface", configure them and monitor them - displaying live video and even playing live audio from a variety of network sources. For playback of content you can either play the generated files in a viewer of your choice (Windows Media Player for example) or you can use the iSpyConnect website. iSpyConnect is a web based service that runs at www.ispyconnect.com and provides a direct interface to control and browse iSpy through a web browser. Using the iSpyConnect website has a few distinct advantages - it displays thumbnails of your captured videos along with preview images (these are generated at the point of maximum movement to enable you to quickly see if the video is of interest or not) and it also provides statistical data, live views, live audio, remote controls and a whole load of other features and benefits. Find out more about iSpyConnect. The iSpy surface is the grey background of iSpy - this is where all the action takes place. You interact with the surface by right clicking and adding objects to it. Objects are either cameras, microphones or floorplans. Once an object has been added to the surface you can move it around (click and drag), resize it (using the grab area at the bottom right, hold SHIFT to maintain aspect ratio), or right click it to edit its settings. The right-click (context) menu displays different options depending on what you have clicked on - for example if you right click on a microphone control it will let you listen to that microphone live, whereas a camera will let you take a snapshot image. You can also add objects to the surface using the "Add" menu on the toolbar. The Getting Started panel has a fair amount of useful content, tips and links to other resources to help you get to grips with iSpy fast. You can save the current configuration (setup of cameras, microphones, floorplans etc) at any time using the File menu. This allows you to backup configurations or even share configurations with friends - if for example you are monitoring webcams. iSpy saves the current configuration when you exit and automatically loads it in when it starts up. iSpy saves files with a ".ispy" extension - you can double click these files to load them into iSpy. The configuration files iSpy saves are XML text files so if you are technically minded you may find it faster to edit these files in a text editor than using iSpy to edit them. Editing the files this way gives you access to some properties not exposed in the iSpy UI (like editing the folder names that iSpy generates for each camera/ microphone). You add cameras and microphones into iSpy using the right click context menu on the grey background or by using the "Add" menu item on the toolbar. iSpy lets you connect to a vast array of hardware and will walk you through the process step by step. 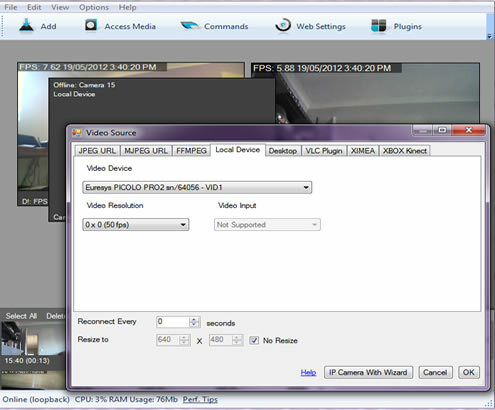 In this example we right clicked, clicked "Add Camera" and we've been taken to the video source dialog. 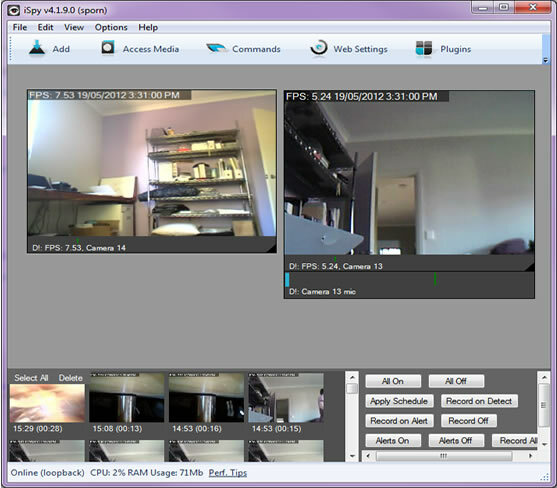 From here we can select a local USB device or choose to connect to an IP camera through JPEG/ MJPEG or VLC, process an existing ".avi" file or add a virtual camera that monitors the windows desktop. Once you have selected your camera click OK and then on the next Configuration page click "Finish" - we'll cover those settings in more detail later. Your camera has now been added to the iSpy Surface and you can move it around with the mouse or resize it using the grab area at the bottom right. To edit this camera's settings, right click on it and select "edit". The process for adding a microphone is identical.